Morning tours depart at 9.30 am and afternoon tours depart at 14.30. This tour departs twice per day, attractions are less busy in the mornings. We are comparing Milan Segway Tour Prices from leading ticket suppliers and Try to find you Cheap tickets prices on the market. Had enough of city walking tours? 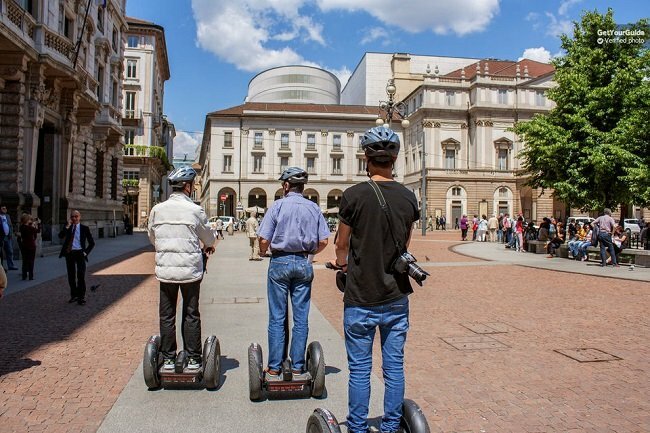 How about a fun filled segway tour through the city centre, visiting Milan's top attractions and learning about the history of the city from a lively commentary in English. Whether your aim is to learn about the city or keep the kids entertained, a city tour by Segway is an ideal way for families, friends or couples to experience Milan. Never driven a Segway before? No problem, your trip will begin with an orientation session before following your guide to Sempione Park. You will leave the park via the impressive marble gateway, Arco della Pace, on route to Sforza Castle, Via Dante and Milan's medieval centre, Piazza dei Mercanti. Have your camera ready on Milan's most famous square, Piazza del Duomo and window shop at the boutique shops inside the Galleria Vittorio Emanuele II. Your audio guide will fill you in on the facts and fiction behind each place. Finally you'll glide past La Scala theatre and into Milan's boho district, Brera where your journey will end outside of Pinacoteca di Brera. If you're bored of the usual slow-paced city walking tours then the Segway tour offers a slightly faster alternative. Ideal for friends, solo travellers or small groups who are looking for a fun introduction to the city. Not suitable for children or disabled. Your Experience With Milan Segway Tour? Glide through the Centre of Milan, stopping to visit the city's most significant sites including La Scala Theatre, Via Dante and Duomo Square. Learn about Milan with an educational audio guide. Combine fast paced fun with sightseeing on your own Segway. Feel confident on your segway after a 30 minute orientation session before setting off with your tour leader. What Milan Segway Tour Includes? Audio guide, headset and local guide. 3 hour city tour by segway (including a 30 minute orientation session). Ponchos (for wet weather and trend setting!). This is a bestselling tour so try to book in advance during the summer. Travelers Reviews about Milan Segway Tour? Travellers say that this is a fantastic way to see the city, whether you're a senior or a youngster. Comments agree that the Segway tour guides are enthusiastic and attentive to safety. The Segway tour has a 4.8 out of 5-star rating on Get Your Guide. It is rated with 5 out of 5-stars on Viator and TripAdvisor. Travellers point out that the meeting point can be tricky to find, so plan a little extra time to make sure that you get there on time. Some tour providers allow refunds but cancellation should be made at least 7 days in advance to avoid fees. Not suitable for children under 12 or persons weighing under 45 kg or over 113 kg .